Even the Methuselah of and elder of rock music, i.e. Iggy Pop, wondered after an incident at one of his incarnations, why anyone would not bring a jar of peanut butter to a concert. Those quotes are of course out of context but I like the fact that people that emitted them. I do have a not very subtle preference for peanut butter. Peanut butter – there is a growing number of variations and people tend to have strong opinions on it, myself not excluded. For some it is a staple. Basically, peanut butter = a derivation based on ground dry roasted peanuts. We all know the staples, i.e. sandwiches (notably the peanut butter and jelly sandwich), but what is more interesting is that it is used in other variations, such as the excellent Reese's Peanut Butter Cups (made of chocolate-coated peanut butter), which are popular with Charles Milles Manson, candy bars (e.g., Snickers), which I have never been a big fan of, and peanut-flavoured granola bars. The two mainstream types you would be familiar with are crunchy (or “chunky” with ground peanut fragments thrown in the mix for good measure to add texture) and smooth. 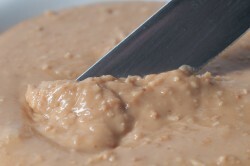 The peanuts in smooth peanut butter are ground uniformly, creating a creamy texture. So far for the theory and very basics. Still with me, sisters and brethren? 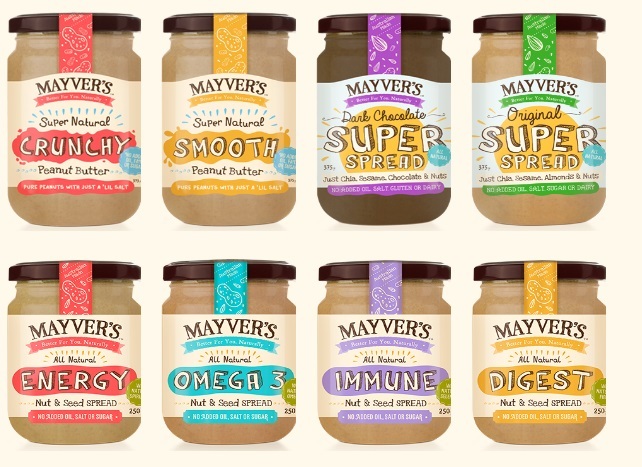 The basic one is Mayver’s new Pure-State Original Super Spread. A natural, solid sugar-free nut butter made from just Chia, Sesame, Almond and nuts that have simply been crushed, blended and bottled. No added oil, salt or sugar. It is deliciously crunchy and high in protein (20g per 100g) but filled with happy amino- and omega-3 acids. My favourite Mayver’s variant is the dark roasted one as well as the Organic Crunchy variety with its bold, rich flavours and no other ingredients than Australian peanut and a pinch of sea-salt for a bit of zing, hence low in salt and saturated fat and high in niacin, the stuff that combats depression and age-related cognitive disease. Their Cacao Super Spread has absolutely no added sugar and is naturally sweetened with dates. Sounds good on paper yet I prefer the aforementioned basic flavours. Enter Jackson 5’s “ABC” - Mayver’s Almond, Brazil & Cashew fits the acronym and makes for a nice change and a slight derivation from their peanut butter focus and hits the spot for me, as the nuts mélange adds a distinct flavour of its own. There is something to be said for Australia’s polyunsaturated and resveratrol laden hi-oleic nuts with their vaguely metallic aftertaste, which do not seem to oxidize compared to other varieties and hence do not go rancid. Freshly roasted and lovingly squashed in sunny Nelson, NZ, these nuts are what Pic’s is working with, with the only other ingredient being sea salt or alternative options without it. Pic’s crunchy variety is a favourite of mine. It is not like other crunchies, which tend to be smooth peanut butter with lumps: Au contraire, it is a mouth filling textural adventure comprised of thousands of peanut pieces, from the size of the finest grains of sand to bits as big as a grain of rice. It will give your tonsils a playful tickle on the way down. That part about tickling sounds good, doesn’t it? To counter the misconception that there is “A” proper way of eating peanut butter, Pic’s has developed the world’s first Peanut Butter Slug. The Slug is pure peanut butter, ground smooth, lightly salted and squashed into a foil tube, containing 30g. It is the thing to have on the go, all ready to eat, full of protein and free of gluten, dairy and sugar and just about everything except peanuts. Robustly packaged in a sensuous peanut butter resistant foil tube, slugs fit snugly into the pocket of your spandex pants or your terribly oversized, saggy camouflage excuses for slacks. Pic’s also offers Cold Pressed Extra Virgin Peanut Oil, also made of Kingaroy nuts, whose light nutty flavour of the peanut oil makes it great in salad dressings, dips and marinades giving food a clean flavour. Another one of Pic's emissions is Cashew Butter. The cashew is a peculiar nut. It grows wild in steamy tropical jungles, dangling from the bottom of a fruit, encased in a nasty toxic shell that is used for making drain cleaners and the like. It roasts and squashes relatively easily and produces a softly textured butter with a slightly sweet flavour. Category “yum +”. The fact that everything from the labeling to the way the jars are created (including hidden messages) provide a source of both information and amusement does not hurt either. Attention to detail is the name of the game and one does not come too often across such a coherent product and brand. Santos Organics is a local community owned enterprise with over ninety unit holders who share an interest in providing best quality organic, natural and GM-Free food with excellent, friendly customer service as well. From humble beginnings, starting off selling bulk foods in the back of a panel van, Santos has organically grown into being a landmark in the Byron Shire, in the Northern Rivers region of New South Wales, with shops in Byron Bay and Mullumbimby. Over the last thirty years their focus has grown, in light of working towards an environmentally and ethically sustainable world, to ensure that all produce is organic and fair trade. The name Santos comes from the Vedic word, Santosh, meaning “Life-force.” In Spanish the name Santos also means ‘Saint’. As this was hard to pronounce for some, the ‘h’ was dropped off, making the name Santos. Their Organic Peanut Butter is 100% peanuts. It is made by Santos using a Durst Peanut Butter Mill. They emerge ready to be spread on your bread of choice. Taking purity to a new level. Proteco Oils is an Australian company based in Kingaroy Queensland that are the leading specialist manufacturers of high quality cold pressed oils, using fresh Australian grown produce, who have been established for over 30 years. Although Proteco's operations have been ongoing for several decades, the new processing plants has elevated Proteco's status to one of the most advanced specialty processors in the world. Their advanced extraction and filtration technology provides cold pressed nutritional oils and they do not employ chemical or solvent extraction processes, ensuring the aroma, flavour and nutritional characteristics of their raw materials are preserved. 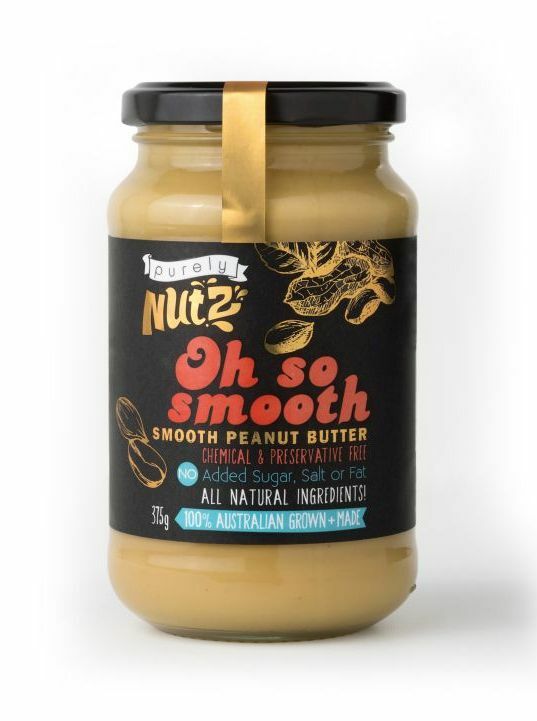 Their range of peanut butter products are pure and natural with no salt, sugar or added fat, made from freshly roasted Australian grown Kingaroy peanuts. In terms of flavour variety, Proteco and its emissions take the cake. While some variations might sound gimmicky, the flavours are well calibrated and unveil themselves in layers, making the consumption a sensual experience. Sounds sexual? It borderline is. Not that their basic “Smooth and crunchy” flavour is nothing to write home about, but the above mentioned variations stopped me in my tracks. They are well-measured treats built on layers of flavours that not only rely on the obvious ingredients, but interact with one another and thereby creating subtle nuances that make eating them a multisensory experience. Trust me – you want to try it for yourself. Stay tuned for the second installment of this series.